You can use Cycads as Medicinal Plants, for Ornamental purposes and some cultures in Africa use Cycads for ceremonial purposes (Cones). You may also use Cycad leaves for thatching/roofing your hut in a Ugandan village. 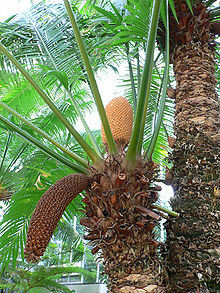 Cycads are seed plants typically characterized by a stout and woody (ligneous) trunk with a crown of large, hard and stiff, evergreen leaves. They usually have pinnate leaves. The individual plants are either all male or all female (dioecious). Cycads vary in size from having trunks from only a few centimeters to several meters tall. They typically grow very slowly and live very long, with some specimens known to be as much as 1,000 years old. Because the Cycads Plants are an Endangered Species, their trade is quite restricted. To buy this plant or its products click here. You will commonly find this plant located in Mpanga river- kabarole and south of kakira sugar plantation.